Violence against women is taking place all over the world, including Azerbaijan, UN Resident Coordinator in Azerbaijan Ghulam Isaczai said. He was speaking in Baku at a conference dedicated to the 16 Days of Activism Against Gender-Based Violence, an international campaign to challenge violence against women and girls. He said that a society, where there is violence, cannot develop. The law enshrines equal rights of men and women, but in real life this is not always so, he noted. 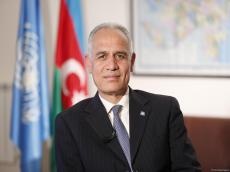 He added that in Azerbaijan, women are more represented in the fields of education and healthcare, noting that however, it is necessary to work to ensure that more women hold leading positions. It is believed that as women are promoted to high posts and their academic degree grows, they become estranged from the family, he said. Such attitude is conditioned by jealousy, he noted.